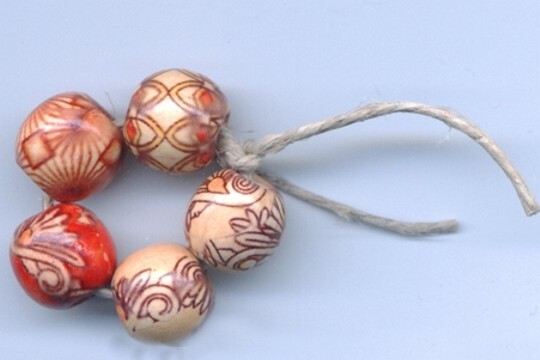 This delightful set of 5 wooden beads comes to you on a hemp cord, easily cut for you to use in your artwork. We think they look quite attractive just they way they are, but we're sure you'll want to separate them and use them for jewelry or embellishments. 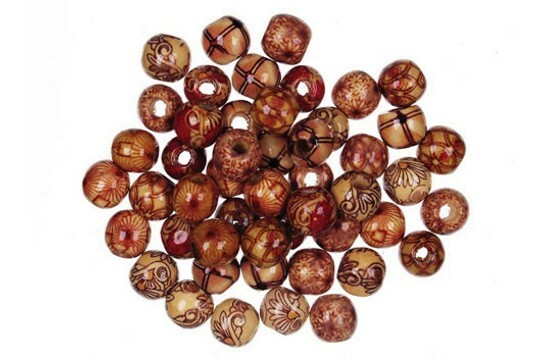 The beads are printed with assorted designs with the same look of reds, naturals and browns. They measure approximately 12mm. We're also showing you a sample of a lot of beads so that you might see the variation. We're showing you a sample of the beads you might get. Each circle is a bit different from the next as all of the beads are assorted.